Today we kick off the first day of our Gut Health Series. Over the next nine days, I will be sharing nutritious and delicious gut healthy recipes from three of my favorite "good belly" cookbooks. Healing your gut - or even improving - goes far beyond a few recipes. I hope these cookbooks will inspire you to nurture your body from within - belly first - and from there enjoy whole body benefits, such as improved energy, better sleep, mental clarity, and more. 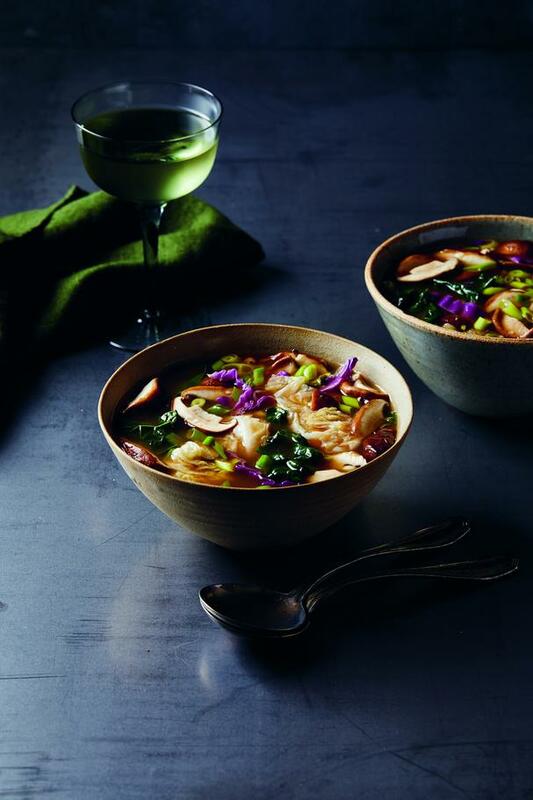 The following Green Tea Shiitake Miso Soup recipe is from The Healing Slow Cooker by health coach and chef Jennifer Iserloh. 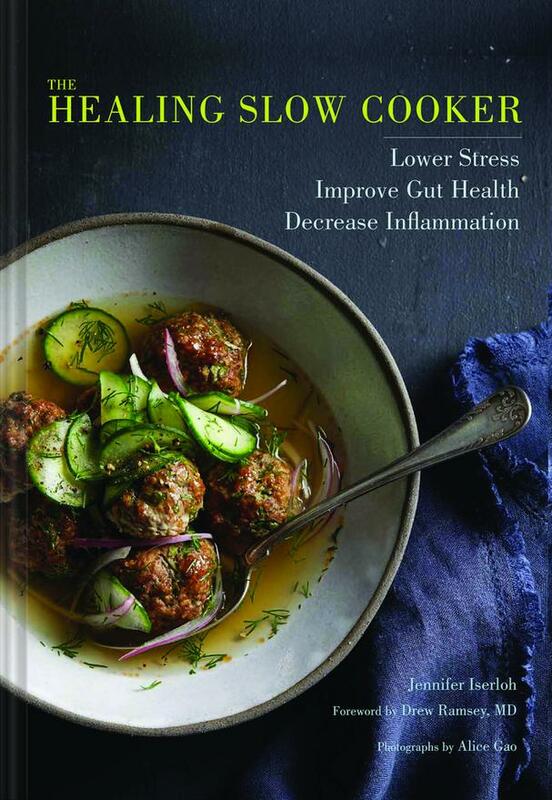 Her beautiful cookbook contains more than 60 trouble-free slow cooker recipes that address different periods of healing: Detox and Calm, Rebuild and Strengthen, Circulate and Stabilize, Sharpen and Rewire, Sustain and Protect, and All Systems Go. Each chapter contains specific healing ingredients that help lower stress, decrease inflammation, and improve gut health. Plus, each chapter also includes a detailed guide to the featured ingredients - such as mushrooms, ginger, turmeric - and how each can make you feel better every day. This nurturing soup recipe is from Detox and Calm. The healing ingredients in this chapter are kale (cleanse), cardamom (soothe), mushrooms (clear), oregano (clear), and tea (calm). Put the broth, vinegar, and miso paste in the slow cooker and whisk well to combine. Remove the tags from the tea bags and tuck the tea bags into the broth mixture. Add the mushrooms, kale, scallions, and garlic, and toss with tongs until the vegetables are coated in the broth mixture. Cover the slow cooker and cook on the low setting for 2 to 2½ hours, until the mushrooms and kale are tender. Discard the tea bags. Spoon into bowls. Drizzle each serving with 1 teaspoon sesame oil and sprinkle each with 1 tablespoon cilantro. Serve immediately. CHEF’S NOTE: To turn this soup into a more filling meal, add 1 lb [455 g] peeled, deveined shrimp or 1 lb [455 g] cubed chicken breast meat to the slow cooker along with the vegetables.